A slight flutter from the shadows may be all an enemy sees of Dark Willow, as she eludes pursuit and controls her foe’s movements with cunning fae tricks. Dark Willow is a master of crowd control, possessing three AoE disables: a root, stun, and fear effect. 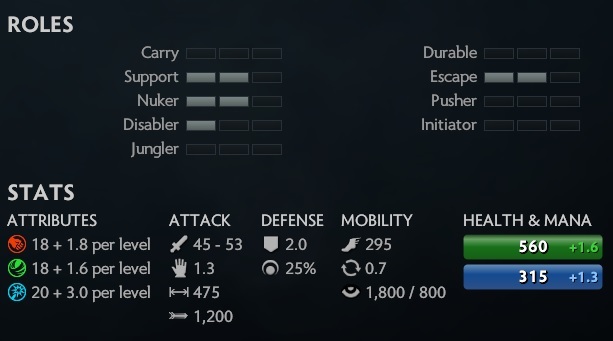 Honestly, I don’t understand why Valve gave her only one point out of three as disabler. Fear and root aren’t as strong as a stun, but overall she has a great skill set. She is also a great nuker with a spammable 20 seconds cooldown skill that can inflict up to 3,600 damage - useful in teamfights, ganks, or simply to farm a creep wave. Finally, her survivability isn’t only assured but the huge number of disables, but also by Shadow Realm, an ability that will render Dark Willow untargetable for 5 seconds. The hero is listed also as a support, but at least in pub games I expect her to be played mostly as a core: her skills, particularly Bedlam, will greatly benefit from a quick level up. Dark Willow creates a maze of brambles in the target area. Enemies that walk into a bramble take damage and are rooted. Bramble Maze is a great crowd control skill for teamfights that take place in a determinate location. For example, near the Roshan’s Pit or while defending/attacking a tier 3 tower. Dark Willow recedes into the shadows, becoming untargetable. Her next attack has increased attack range and deals bonus magic damage, and will end Shadow Realm. Shadow Realm is a survivability skill paired with a nuke. While the damage will become negligible in the late game, being untargetable for 5 seconds will save your life in multiple circumstances. Cursed Crown is a simple delayed AoE stun. The radius isn’t huge but if well used you can potentially stun 3-4 heroes for 3.5 seconds. A great skill for both ganks and teamfights. You can chain combo it with Bramble Maze, disabling the heroes affected for a total of 6 seconds. Dark Willow’s pet wisp roams around her for the duration, rapidly attacking nearby enemies. Bedlam cannot be used while Terrorize is active. What surprises me the most about Bedlam is the 20 seconds cooldown. You can just spam it no stop to push lanes or farm the jungle. It is basically a moving turret that for 4 seconds will attack 1 target at a time with 0.25 attack interval. In 4 seconds, you can hit the opponents up to 16 times for 225 damage each, inflicting a total of 3,600 damage! I had to see it with my eyes. After trying Bedlam in the game client, I can say that when maxed out it can clean an entire creep wave, and simultaneously also kill a 1k hp hero. All in 4 seconds. Dark Willow releases her pet wisp to terrorize her enemies. After a short delay, all enemies in the target area become fearful and run toward their home fountain. Definitely, Terrorize will ruin many pub games. I can already imagine how many times the Dark Willow in my team will save the opponents from a sudden gank, or move them away from the teamfight location. The skill can have different uses: the most obvious is disengaging from a fight and running to safety, but you will also use it to destroy the enemy formation for an easier initiation. +300 Shadow Realm maximum damage will bring the total to 660. It is a good nuke against squishy heroes, with only 12 seconds cooldown.